These days, the big news at the farmers market is squash. Small or huge, bumpy and warty-like or smooth, dark or cream-colored, they are the celebrities of the season. As I look at these unique vegetables, I can’t help but think of the possibilities for beautiful soups, salads, and other dishes of autumn. Providing sculptural interest to my toddler, and anyone who walks in the door, are several soft and hard-shelled winter squashes—delicata, golden butternuts, green kabocha, flaming red-orange red kuri (also known as red kabocha), and bright orange pumpkins—that currently sit on my kitchen counter. I’m not only excited to cook with them, but I’m also even more thrilled that my little one—only 26 months of age—can name each one of them with ease—something I didn’t learn to do until…ahem…last autumn when I started going to the farmers markets more regularly. I love going to the farmers markets because they’ve given me the opportunity to learn so much about seasonal foods. Grocery stores, with their tomatoes in winter and year-round fruits and vegetables from all around the world, make it so confusing to know what’s actually in season and what’s not. The markets have also been a fabulous opportunity for me to teach my little one about food and gratitude for where it comes from. At home, when I cook, my little one often stays near me in the kitchen. Lately, I’ve set him up with a bowl of uncooked beans or lentils and have asked him to help me “sort” the beans. Of course he just plays, picking the beans/lentils having fun with the feel of sticking his little fingers in them or transferring them from one bowl to another, but if you ask him what he’s doing he proudly says, I hepping maman sort da beans. My sous chef in training. After sorting through some red lentils I had on hand, I decided to make a pot of lentil soup. I should say that I love almost any kind of lentil soup and can eat it throughout the year. 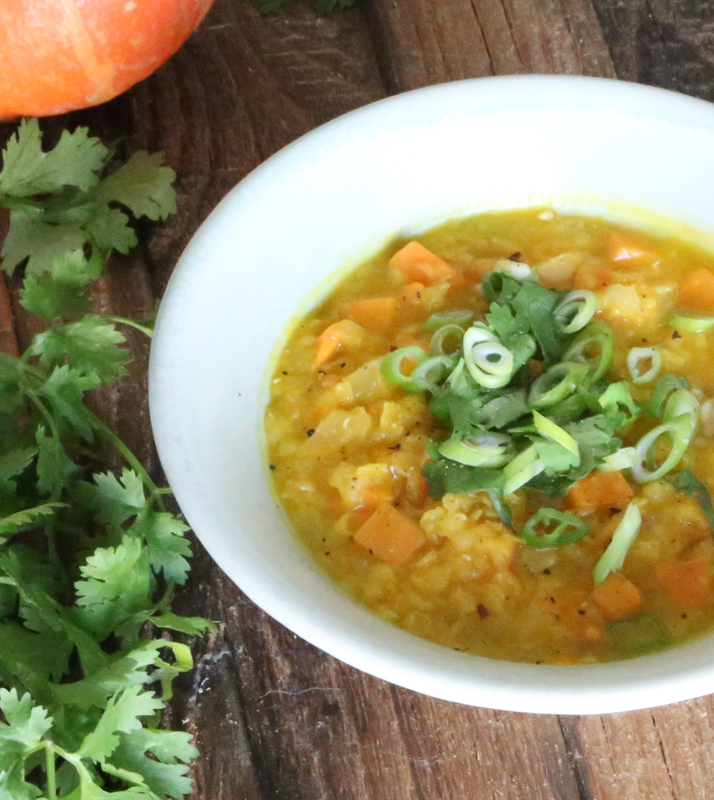 But in the fall, I especially like to pair lentils with sweet winter squash like butternut, kabocha or, as in this soup, red kuri squash. Chunky and satisfying, this soup has gentle hints of freshness that come from notes of fresh ginger, cumin and fresh herbs. Not only is it hearty, but coconut milk helps make it a bit creamy. This soup is also simple and adaptable. At times I’ve made a version with carrots or Yukon potatoes and have, on occasion, added a teaspoon of curry powder to add a little more depth of flavor. Serve with with cooked farro (or brown rice) and garnish with chopped cilantro, sliced green onions, a splash of lime juice, homemade croutons, and/or toasted pumpkin seeds. Rinse lentils until water runs clear. In a large pot, combine lentils with 4 cups water and salt and bring to a boil. Reduce heat and gently boil until the lentils start to lose their shape, about 15-20 minutes. Meanwhile, cut the red kuri squash in half, seed it, and put the halves cut side down in a baking pan with a little water, about 1-2 tablespoons of water. Roast squash until soft, about 40 minutes. Over medium heat, sauté onions in olive oil with a nice pinch of salt until soft and golden brown, about 20 minutes. When lentils are just tender, add the onions, sweet potato, ginger, cumin, turmeric, red pepper flakes and broth to the pot. Simmer, covered, for about 20 minutes. As soon as the squash is cooked through, scoop it out of its skin and add the squash flesh to the pot. [As a quick side note, I decided to purée my squash after I scooped it out, but it wasn’t necessary as the squash was soft enough to be added to the pot and mix nicely with the lentils]. Simmer for about another 10 minutes then add coconut milk. If the soup seems too thick, add up to one cup more of broth and/or coconut milk. For soup with a rustic texture, you can serve it as is or purée half of the soup in a blender and mix it back in the pot, or pulse the whole pot a few times with an immersion blender. For a more smooth soup, purée the whole pot of soup in batches with a blender or use an immersion blender. Be sure to taste and adjust seasoning, adding more salt*, black pepper and red pepper flakes according to taste and how much heat you can take! Serve on a bed farro (or other grain) and top with cilantro, green onions, toasted pumpkin seeds and/or lime wedges. Note: I also like to serve this and many other soups topped with avocado slices dressed in olive oil, salt and fresh lime juice. Yum! If you can’t find red kuri squash, try using butternut squash instead. Both are delicious! *I try not to make suggestions on the amount of salt to be used as it really is a matter of taste preference. Also, the amount of salt needed can vary depending on the broth used. When I can, I prefer to use a light (not too salty) homemade vegetable broth. This allows me to season the final product as I would like. Other times I buy my vegetable broth. If using store bought broth, be sure to buy the best tasting low-sodium broth you can afford. Enjoy! I made this tonight, and it was amazing! Such a hit and easy to make. I used butternut squash, because I have eleven of them, so I needed to use them up. Thank you for this comforting, delicious soup! Hi Emilie, thanks so much for your comment/feedback! It’s so helpful when my readers let me know what works and what doesn’t. So thank you!!!! I’m so happy you tried and liked this soup!!! 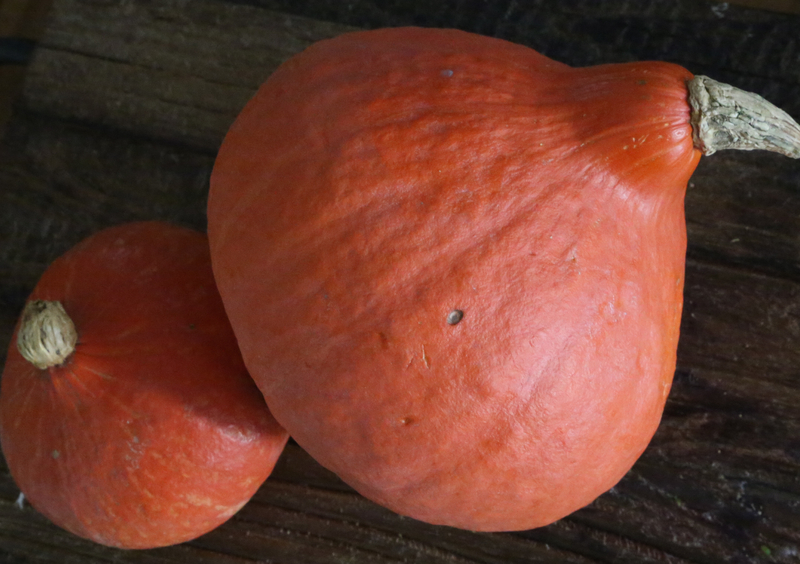 I’m hoping to make a few soups with butternuts this weekend. If they turn out well I’ll be sure to share! Thanks again! What a delicious and hearty recipe, Martine. I am excited to try this soon. I only recently discovered and cooked red kuri squash (in a variation of the Thai curry I posted), and was pleased to find I like the taste just as much as butternut squash. We have been eating pretty much everything we make over barley and farro when we feel like we need a grain, so I love your suggestion to serve this soup over these grains. Thanks for the recipe and wonderful fall meal ideas! Thank you Ngan! I just had a look at your Thai curry recipe and it looks delicious too. I can’t wait to try a vegetarian version! Yes, red kuri squash is quite similar in taste to butternut. I find they are easily interchangeable in recipes. My family and I love adding barley or farro to our soups and I’m interested in trying out other grains. In my cupboards is a bag of an ancient grain called Japanese Hato Mugi (Job’s Tears). Have you heard of it? It’s considered medicinal in Asia and resembles large barley. Haven’t tried it yet, but will try to add it to soup this weekend! If I like it I’ll be sure to share my experience!